Kenner Garrard (1827-79), Brig. General USA (KY/OH). San Antonio, TX (POW-1861-62), Fredericksburg, Chancellorsville, Gettysburg, Rappahannock, Atlanta campaign, Nashvile, Mobile (captured). 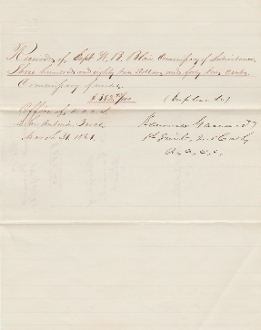 Document Signed (DS), 1 page, 4to., San Antonio, Texas, March 31st, 1861 pertaining to commissary funds received from Capt. W. B. Blair. Garrard signed with rank as 1st Lieut. U.S. Cavly. Texas joined the Confederate States of America on March 5th, 1861. Thus the document was used during the Confederate period of Texas. Garrard was captured at San Antonio, Texas on the day of the bombardment of Fort Sumter. He was officially exchanged on August 27, 1862. William Barrett Blair later served as Confederate staff officer.